Starlight, by Camille Roskelley for thimble blossoms, is a jelly roll pattern, but I'm using fabric from my stash, so my first order of business was to cut my strips. The next step was to piece a few strips and cut some triangles. The pattern provides a template but I'm using the 60 degree ruler by Creative Grids, it couldn't be easier to get things lined up and cut those pieces. And here are all my triangles. 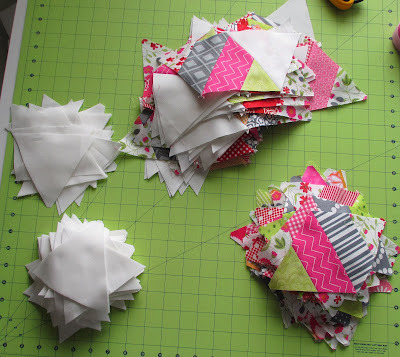 The floral fabric that I'm using for my large triangles is also the fabric I'm using for all my star centers. Normally, the first thing I do when I start a new pattern is to make an inspiration block. I enjoy looking at one finished block as I make all the pieces and parts for the remaining blocks, plus it's a good double check that I'm understanding the sizes of all the pieces and parts. This pattern is a little different, I can't really piece together a star block, because of the way the rows are combined, but here's a little peek of what a star should look like. I'm thinking that center fabric matching the outer triangles looks pretty good so far. On my last post I got a couple of comments from folks regarding working with these triangles and this pattern, but I have to say so far, I've had no problems at all. A few corner triangles on these pieces and I'll be good to start working on those rows. So far everything is coming together perfectly, but I'm really eager to see a finished star block. Like many of you I'm cleaning my house in general and my ovens, refrigerators, and cupboards specifically, in preparation for Thanksgiving. But I'm very motivated to speed through those chores each morning to get up into my sewing room each afternoon. Plus spreading the To Dos out during the coarse of a week makes them seem less like work. It's more of the same for this week but you can bet I'll be racing through my daily To Dos to get back to working on Starlight. I'm just absolutely loving your start on this one...these are going to be the cutest stars! Oh I really like your idea of to do list chores and then the reward of sewing...that's what I should have done! Thanks I'm adopting that practice beginning today! It's a great pattern (love Camille's patterns anyway) and love your fabric choices. Please let us know how you get on with sewing it all together. The pics in this blogpost are really helpful for those (like me) who have not done a lot of machine patching yet . That really looks tricky Thelma... is is all set in seams?!? So pretty! I like to get a 1st block put together quickly too, in fact I often just cut enough for a sample block. Either I'm a lazy cutter or a cautious quilter I guess! In THEORY I try to do my work around the house in the mornings and sew in the afternoons. Looking forward to watching this one come together. Wow, you are off to a roaring start; that's quite a bit finished. I love the colors, and especially, your focus fabric. Love how your block is going to look! I liked the lighter version too! The floral is going to be perfect. Can't wait to follow your progress! The start of another great Thelma Quilt and those fabrics are just great. Thinking those stars are going to be a bit tricky but know you will have a way of making them easy....can't wait to see this one! Oh I can't wait to see how this turns out! Hi Thelma, I noticed all your strips hanging on the rod and remembered in a previous post you mentioned using a GO! cutter. I'm thinking of asking for one for Christmas and wondered how you use yours? I was wondering how useful it would really be? I love the idea of cutting strips with it, but beyond that the dies are so expensive and wondered which dies you started with? Love the fabric you chose to go with your focus fabric. You're so talented! This is looking great Thelma! I also prefer to spread out my chores over a week or so when I can. It makes it seem like not so much work to me and I get a little fun in each day as well.